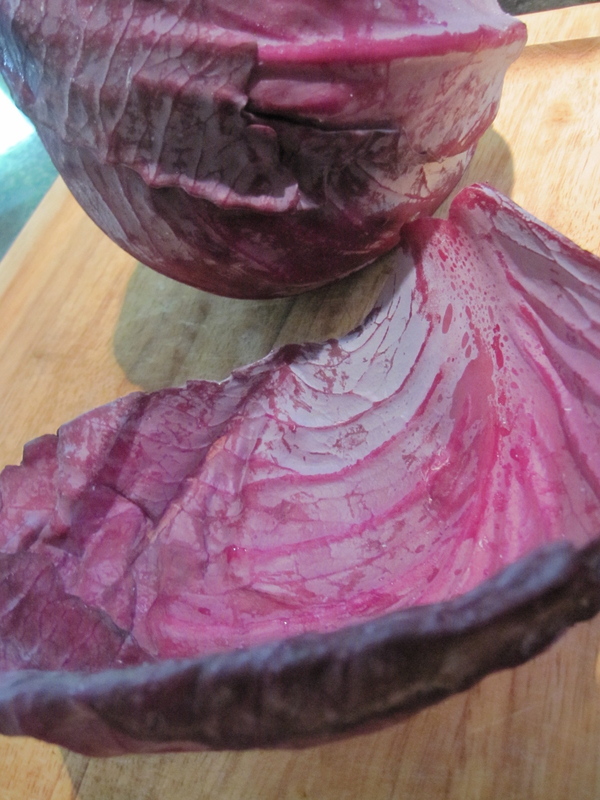 Fermenting Dissent (with Determination, Cabbages and Salt) | Laura's "Rules"
Later this week, I’ll post about the news on toxics out of the U.S. Senate, which last week passed the Safe Chemicals Act out of committee on a party-line vote. I’m scanning the testimony, much of which is worth a gander. Really, the Safe Chemicals Act is a bit of a no-brainer, so it’s terribly disappointing to see partisan political deadlock on something so common-sense and fundamental to health. Andy Igrejas, Campaign Director for Safer Chemicals, Healthy Families, wrote a great piece highlighting the problems for Republicans and the chemical industry if they continue obstructing progress on this issue. As he points out, educated consumer demand and our skepticism about the safety of products is a real threat to corporations when so many serious questions remain about the chemicals in our products and food. So keep asking questions, my friends, and letting the companies know we are all watching and taking names. When life is such a mix of sweet and sour, that always feels like an invitation to pickle something. And over the weekend, a golden (or really purple) opportunity presented itself when my new pal Sharon offered to teach me how to make sauerkraut the old-fashioned way. 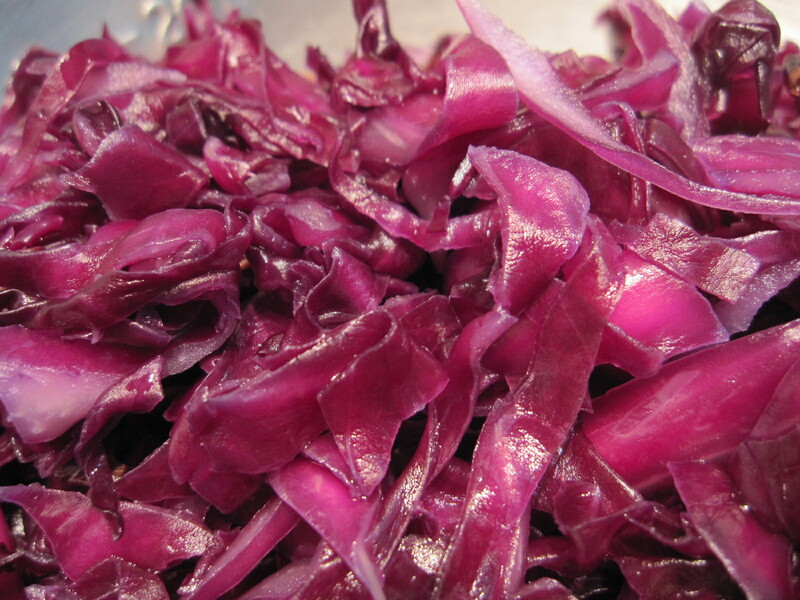 Captain Cook loaded 60 barrels of sauerkraut onto his ship. After 27 months at sea, 15 days before returning to England, he opened the last barrel and offered some sauerkraut to some Portugese noblemen who had come on board….This last barrel was perfectly preserved after 27 months…and had also preserved sufficient quantities of vitamin C to protect the entire crew from scurvy. 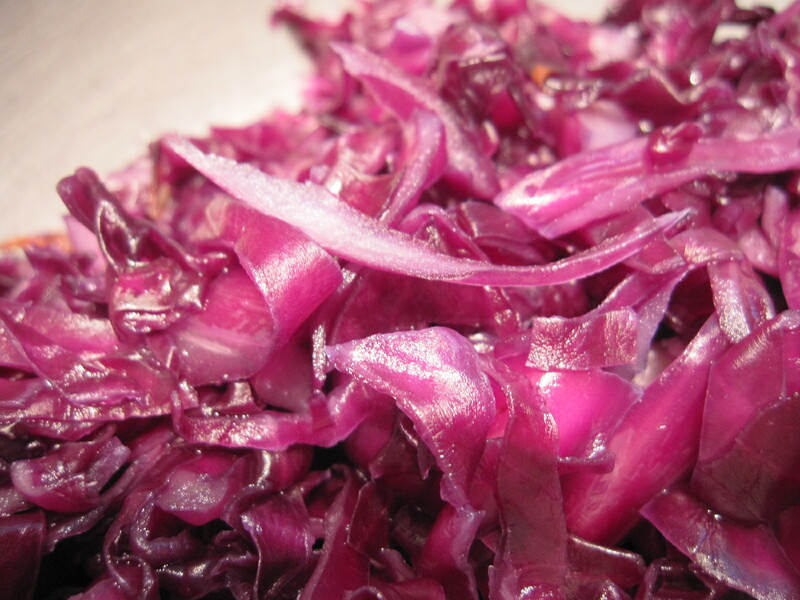 Fermented foods are terrific for health, as they help to balance out the elaborate ecosystems in our gut. Traditional diets around the world use fermented foods far more frequently than we do in the Western diet, where half-limp dills tend to be the only sign of a once-robust spread of zingy condiments. From kefir to kimchi to kombucha, miso to mango pickle, preserved lemons to pickled beets, fermented foodstuffs are commonplace in other cuisines, and are considered essential to good digestion. In my husband’s native India, meals typically included at least three kinds: intensely spiced pickles of many flavors, as well as fresh-made, live bacteria yogurt (or “curd”) and buttermilk. Don’t tell the drug companies, but it turns out that making a high-powered new ecosystem to better service one’s digestive plumbing is simple, fun and deeply satisfying. Under Sharon’s expert tutelage, we drank some wine — fermented again! 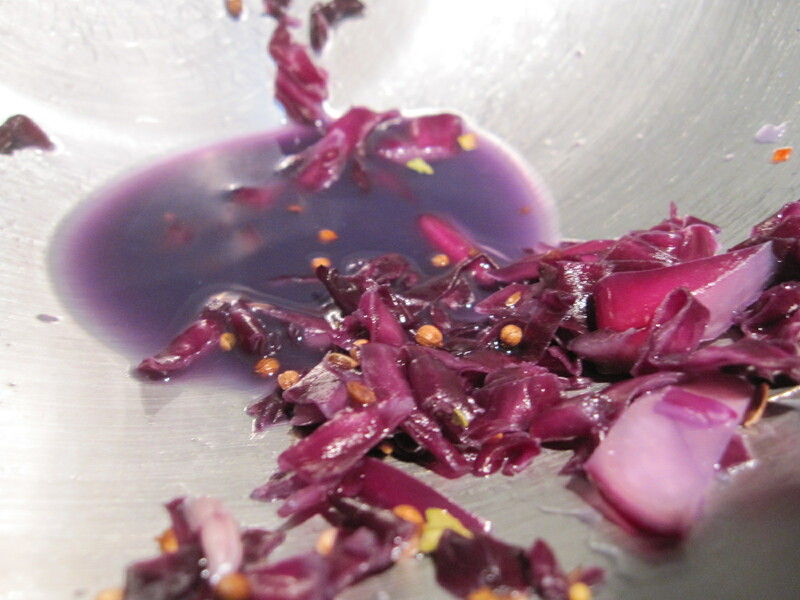 — and kneaded stringy pulpy cabbage pieces until they gave up their water and our hands were stinging from the salt. It was a wonderful and relaxing way to spend our daughters’ nap time on a summer afternoon. Below I provide all the details so that you, too, can share in the fun. 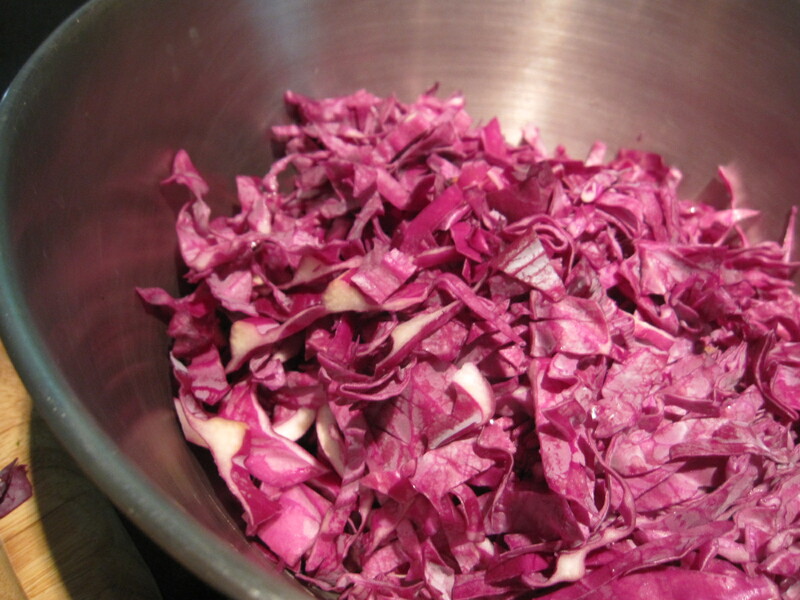 Chop cabbage into chunks and then into fine strips and place in a large bowl. Optional: Sip your wine. Laugh and talk. Discuss the cool new cookbook on fermentation that just made the Amazon bestseller list. 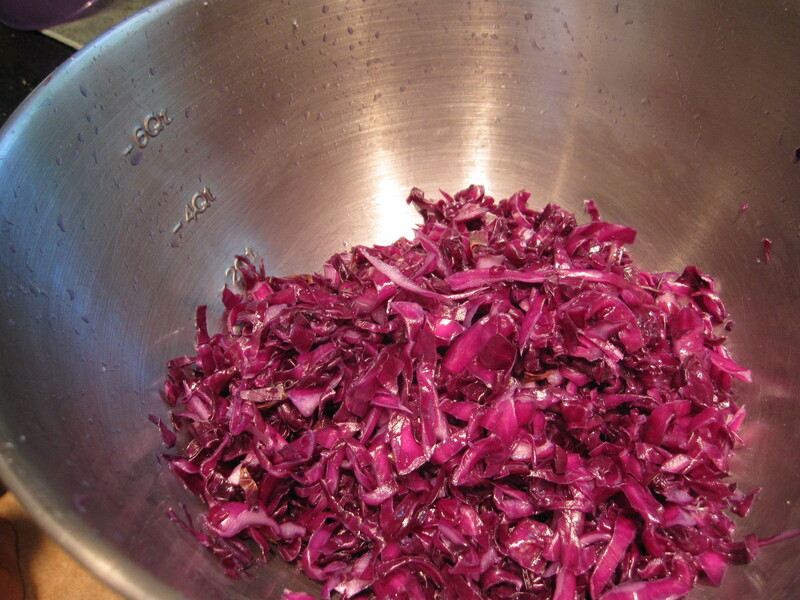 Wash your hands well and add 1 generous Tbl of sea salt per head of chopped cabbage. 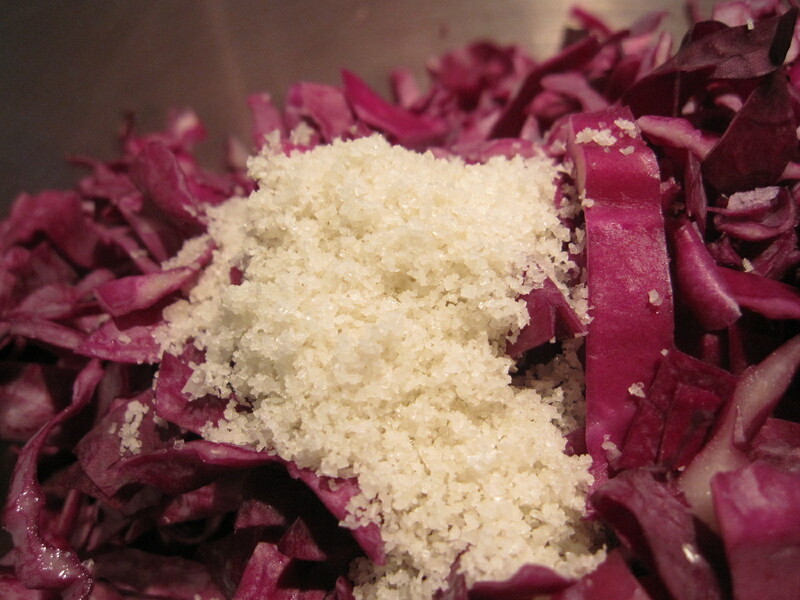 Get your hands in there and squeeze and knead the salt into the cabbage. It will begin to give up its water and you’ll learn all about any small cuts and hangnails you may have. After about 12 minutes of kneading, it was limp and beautiful, and about half the volume. If you like, add the pickling spices at this stage and knead them in a bit. Stuff the proto-sauerkraut into a crock, glass jar or other non-toxic container (Note: Ball jar metal lids, and most other metal lids, have a coating of BPA on them!) and push it down so that the surface of the cabbage is below the water it has generated. Add the whey in this process if using it. Leave some room for more water to develop at the top (mine started to leak violet juices after a day when not enough room was preserved). Cover, put it somewhere where it will stay around 70 degrees F. Wait anxiously for 4 to 7 days before opening and sampling your creation. After opening, store it in the refrigerator, where it will keep for a month or more. 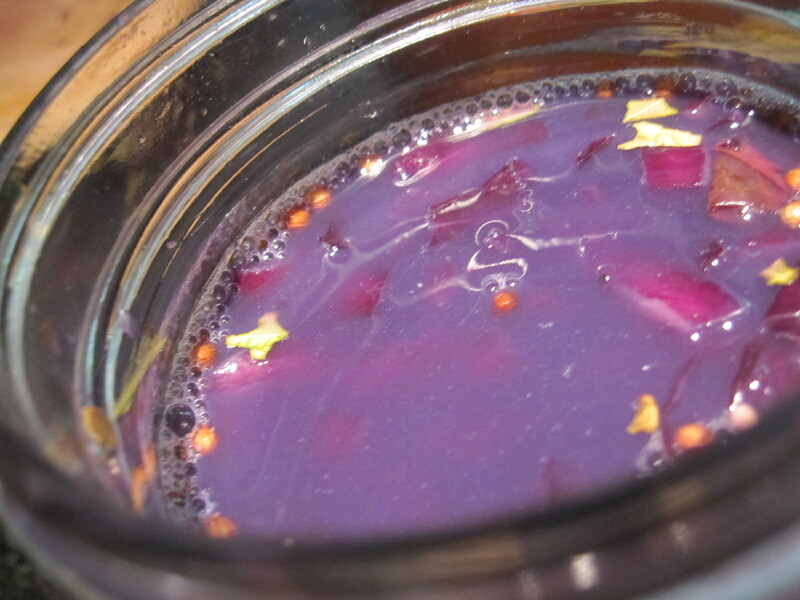 Makes about 3 and 1/2 cups of royal purple goodness. Serve over greens, next to sausage, in soups, or just as a nice condiment. If you have variations on this recipe, other additions, or great ideas for how to use and serve sauerkraut, please share them in the comments! This entry was posted in Recipes & DIY and tagged alternatives to medication, Cabbage, cabbages cabbages, condiments, cook, digestive, ferment, Fermentation, fermented foods, food, gut, health, healthy, Home, Igrejas, intestinal health, Mason jar, pickles, Pickling, preserving, recipe, Safe Chemicals Act, salt preservation, Sauerkraut, sausage, side-dish, Weston A. Price by Laura MacCleery. Bookmark the permalink. 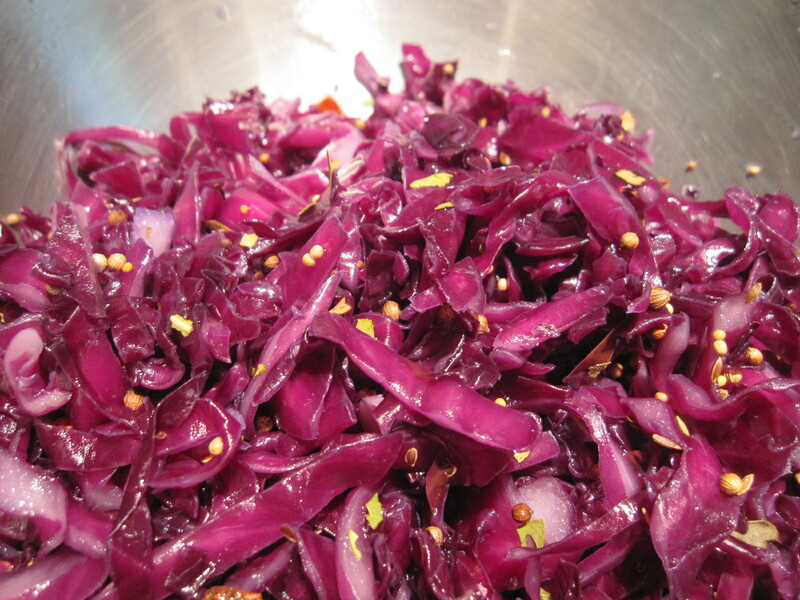 I’ve been eating a lot of fermented foods, trying to get everything into balance. Try this on for size: a sandwich made with sauerkraut, kim chi, tempeh, and pickles! Yum. Thanks for the post. Sounds wonderful! 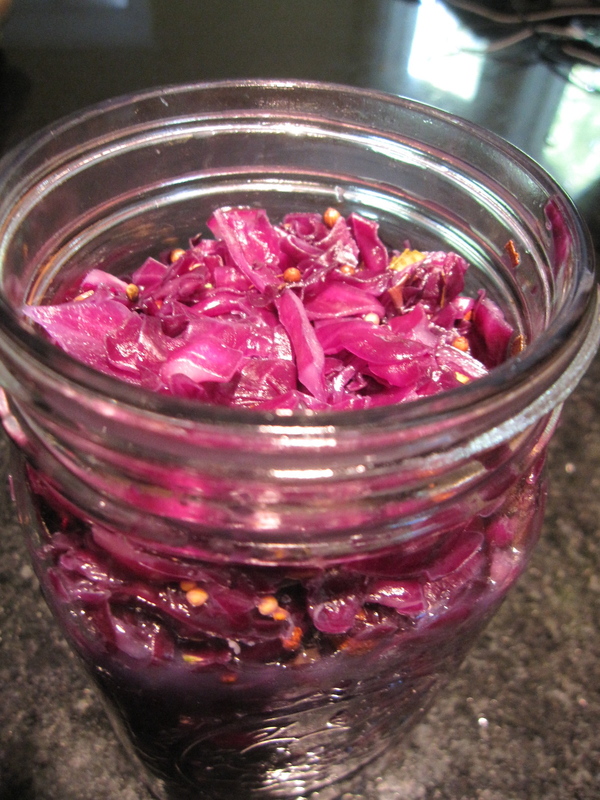 Fermented foods all!! That sandwich does does sound amazing! I keep meaning to try my hand at this. Do you have to weight the cabbage down or did you just smoosh it into the liquid and then leave it? And it looks like you used a canning jar–what do you cover them with if not lids?! Hi Emmy! I didn’t weight it down — but did smash it into the jar and under the water. Sharon used a large crock that looked very authentically German — I used a canning glass jar with a plastic lid (most likely polypropylene, though I didn’t check). I have on order some large all glass with a rubber gasket Weck canning jars, and was planning a post on safe canning jars after those arrive and I have time to check them out. I’m sure for an accomplished cook like you, this recipe would be simple. After tasting them, I would im omit the pickling spices, as they stay chunky and it can be unpleasant to chop on a big seed suddenly.